I have been to NAB for the last twelve straight years, and it looked like I would break my streak this year, being booked on a travel job through the middle of April. 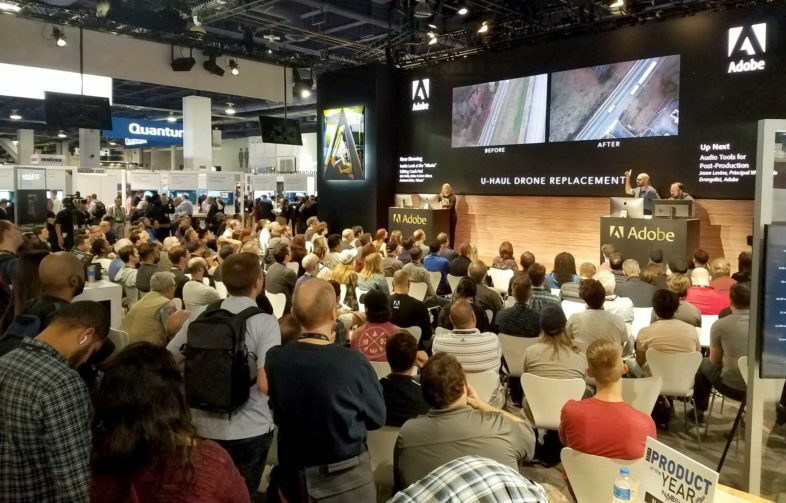 But that phase of the project wrapped early, and so I was headed home a week early, and was able to arrange my layover in Vegas, to make a last minute visit to the NAB Show. Do to the short notice, I didn’t have many scheduled events, and instead just browsed the halls for new products, and crossed paths with people I have met in years past. 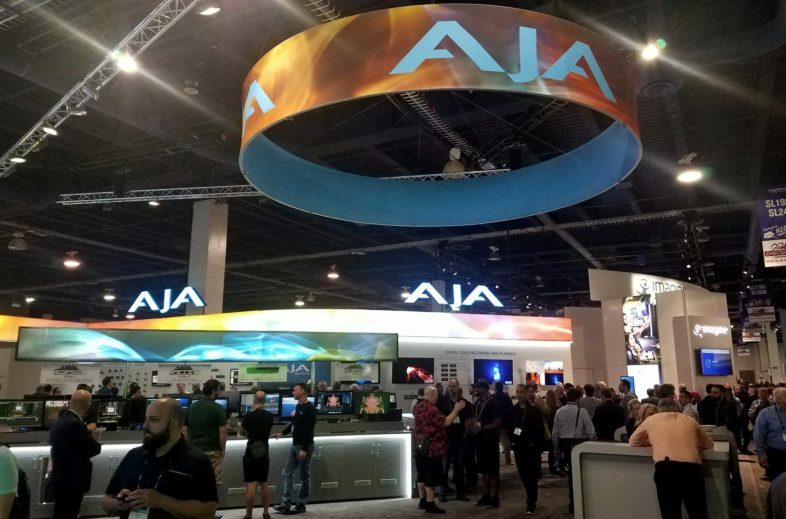 There are always a slew of new product announcements the week of NAB, and this year is no different. As a Premiere editor, the developments from Adobe are usually the ones most relevant to my work and life. 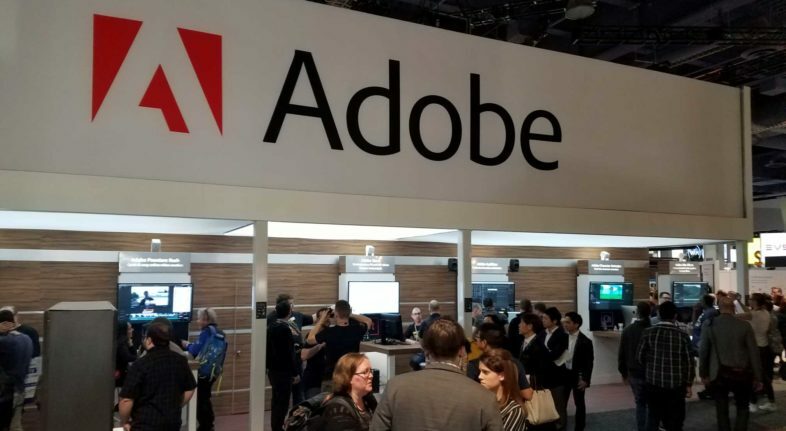 Similar to last year, Adobe was able to get their software updates released a week before NAB, instead of promising them soon, and for eventual release months later. The biggest new feature in the Creative Cloud apps, is AE’s new “Content Aware Fill” for video. This will use AI to generate image data to automatically replace a masked area of video, based on surrounding pixels, and surrounding frames. This functionality has been available in Photoshop for a while, but the challenge of bringing that to video is not just processing lots of frames, but keeping the replaced area looking consistent across the changing frames, so it doesn’t stand out over time. The other key part to this process, is mask tracking, since masking the desired area is the first step in that process. Certain advances have been made here, but based on tech demos I saw at MAX, more is still to come, and that is what will truly unlock the power of AI that they are trying to tap here. To be honest, I have been a bit skeptical of how much AI will impact film production workflows, since AI powered editing has been terrible, but AI powered VFX work seems much more promising. Adobe’s other apps got new features as well, with Premiere Pro adding Free-Form bins for visually sorting through assets in the project panel. This affects me less, as I do more polishing that initial assembly when I am using Premiere. They also improved playback performance for Red files, acceleration with multiple GPUs, and certain 10 bit codecs. Character Animator got a better puppet rigging system, and Audition got AI powered auto-ducking tools for automated track mixing. AJA was showing off the Ki Pro GO, which records up to 4 separate HD inputs to H.264 on USB drives. I assume this is intended for dedicated ISO recording of every channel of a live switched event, or any other multi-cam shoot. Each channel can record up to 1080p60 at 10bit color, to H264 files in MP4 or MOV, up to 25Mb. 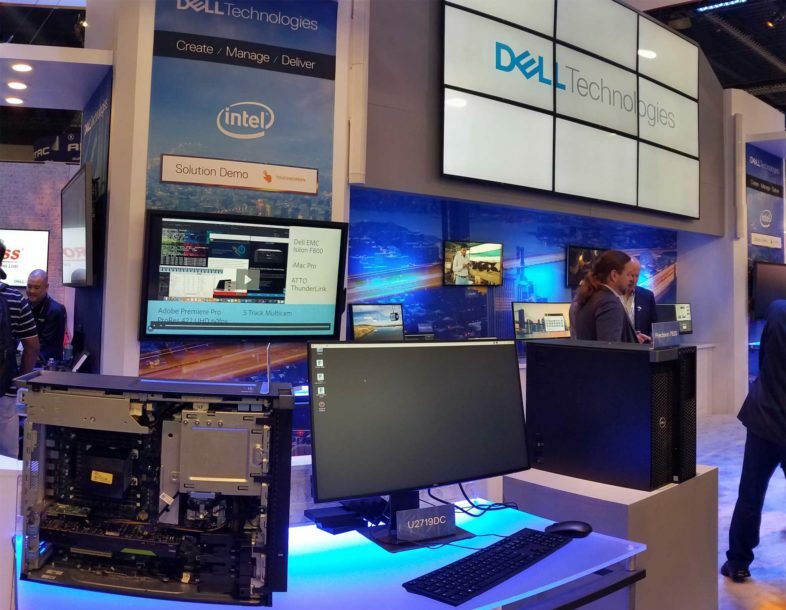 HP had one of their existing Z8 workstations on display, demonstrating the possibilities that will be available once Intel releases their upcoming DIMM based Optane persistent memory technology to the market. I have loosely followed the Optane story for quite a while, but had not envisioned this impacting my workflow at all in the near future, due to software limitations. But HP informed me that there will be options to treat Optane just like system memory (increasing capacity at the expense of speed) or as SSD drive space (with DIMM slots having much lower latency to the CPU than any other option). So I will be looking forward to testing it out once it becomes available. Dell was showing off their relatively new 49″ double wide curved display. The 4919DW has a resolution of 5120×1440, making it equivalent to two 27″ QHD displays side by side. I find that 32:9 aspect ratio to be a bit much for my tastes, with 21:9 being my preference, but I am sure there are many users who will want the extra width. I also had a chat with the people at Digital Anarchy about their Premiere Pro integrated Transcriptive audio transcription engine. Having spent the last three months editing a movie that is split between English and Mandarin dialogue, needing to be fully subtitled both directions, I can see the value in their tool-set. It harnesses the power of AI powered transcription engines online, and integrates the results back into your Premiere sequence, creating an accurate script as you edit the processed clips. In my case, I would still have to handle the translations separately, once I had the Mandarin text, but this would allow our non-Mandarin speaking team members to edit the Mandarin assets in the movie, and will be even more useful when it comes to creating explicit closed captioning and subtitles, which we have been doing manually on our current project. I may post further info on that product once I have had a chance to to test it out myself. There were three halls of other products to look through and check out, but overall I was a bit underwhelmed at the lack of true innovation I found at the show this year. There were reported to be over 90,000 people at the show this year, but I was able to book my hotel room the night before. Now I was only able to attend for the first two days of the exhibition, so I may have overlooked something significant, but there isn’t much else that I am excited to try out, or that I expect to have much of a serious impact on how I do my various jobs. It feels like most of the new things we are seeing are merely commoditized versions of products that may originally have been truly innovative when they were initially released, but now we are just seeing slightly more fleshed out versions over time. There seems to be much less pioneering of truly new technology, and more repackaging of existing technologies into other products. I used to come to NAB to see all the flashy new technologies and products, and now it feels like the main thing I am doing here is a series of annual face to face meetings, but maybe that is not necessarily a bad thing.